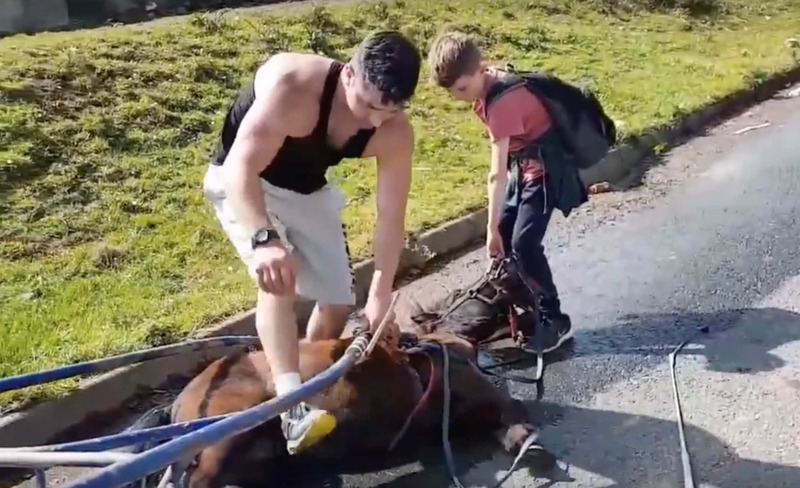 An investigation was launched this week after a video showing an 'abused' pony being dragged along a road in Clonmel, Ireland surfaced on social media. The video - taken by witness Aneta Kopec - shows a Shetland pony collapsed on a roadside, while still attached to a cart. Before long, one young man attempts to drag the apparently exhausted or ill animal across the pavement, while another yanks at the pony's tail. Kopec - who says the pair also threw stones at her while her baby was in the car - became increasingly distressed. She shouted: "What are you doing to this horse? The Irish Society for the Prevention of Cruelty to Animals (ISPCA) is now working with local police to investigate the incident. An ISPCA representative said: "It is not acceptable that any animal is pushed to the point of collapsing." A statement on The Tipperary Garda information page said law enforcement has made 'significant progress into the investigation' of the 'animal cruelty' that occurred. Also included was a call to the public for any further information on the incident.